Is there any conceivable way to follow up the titanic triumph of "Best of Both Worlds?" That was the issue faced by the creative team behind The Next Generation in the spring of 1991. Their solution? To delve deeply into a previously under-explored fan favorite character, and blow up the series' continued story arcs involving the Klingon empire and shadowy, ever-present Romulan threat. But was their effort good enough to deserve mention in the same breath as their previous Borg-tacular two-parter? This week hosts Cam Smith and Tyler Orton, along with special guest Nick Eagland, take turns sitting in the High Council throne and debating whether "Redemption" belongs in the canon of great feature-length television Trek tales. 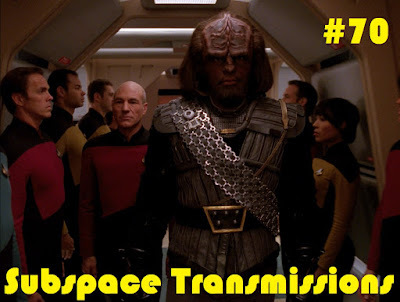 As the trio discuss all of the Gowron vs. Duras drama, Worf's eternal quest for honor and Data's command challenges, they also strive to determine how well the parts form a whole and whether or not this Klingon-centric saga warranted two heavily hyped hours to tell. Wanna appear on the show? Shoot us a 30 to 60-second audio clip telling us your thoughts on REDEMPTION and you could take the spotlight in an upcoming program! You can also send any other questions, topic ideas or feedback to subspacetransmissionspod@gmail.com!